I love, love, love sweet potatoes. They are one of my very favorite foods! I love them roasted, in taquitos, or in sweet potato casserole. My new favorite way to cook them is a little different from my other recipes-this one uses the crockpot! If that wasn’t enough to make it a favorite we top off the Slow Cooker Sweet Potatoes with crispy crumbled bacon-that alone got it some enthusiastic thumbs up from my family! Cut sweet potatoes into 1/2 inch cubes. You may peel them if you like but I prefer to leave the peels on mine. 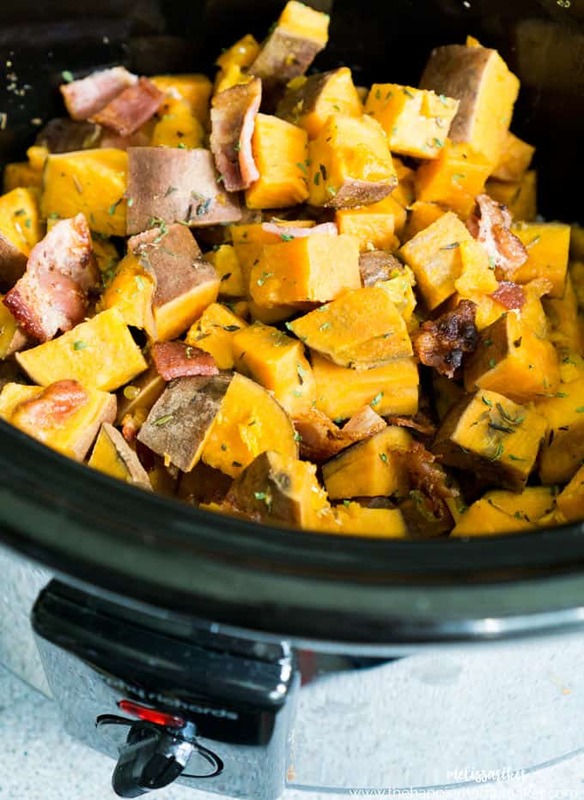 Place all the sweet potatoes in the slow cooker. In a small bowl combine orange juice, brown sugar, salt, sage and thyme. Mix well and pour over potatoes. Cut butter into small pieces and place over the potatoes. Cook on low 5-6 hours or high 3 hours. Serve topped with crumbled bacon. 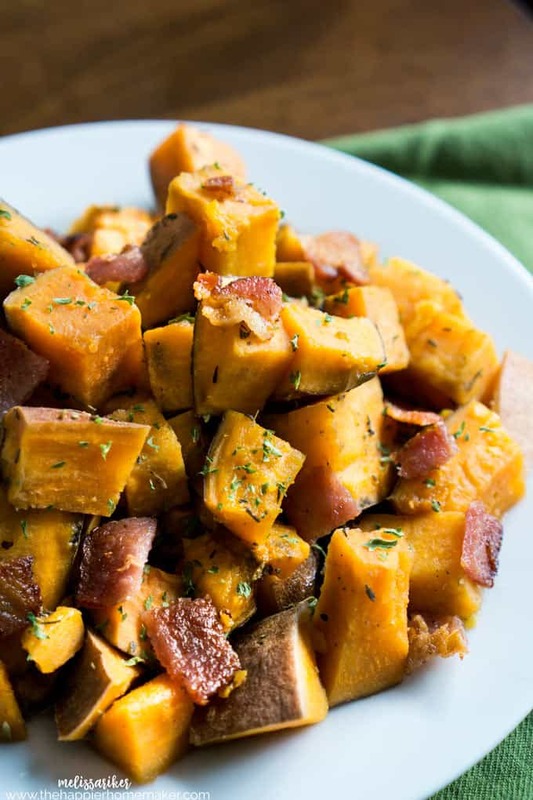 Herbed sweet potatoes cooked in the slow cooker and topped with crispy bacon crumbles-the perfect sweet and savory side dish recipe! 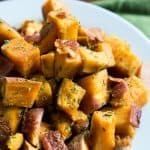 Cut sweet potatoes into 1/2 inch cubes. You may peel them if you like but I prefer to leave the peels on mine. Place all the sweet potatoes in the slow cooker. In a small bowl combine orange juice, brown sugar, salt, sage and thyme. Mix well and pour over potatoes. Cut butter into small pieces and place over the potatoes. Cook on low 5-6 hours or high 3 hours. I wonder could you use ham?